When searching, sometimes you have a pretty good idea of what you want to see and what you don’t. With features like Google Instant and Instant Previews, you’re able to quickly scan results to find exactly what you’re looking for. This week’s changes continue to make Google more interactive so you can get to your desired search result even faster—whether you’re on the go, looking for videos or weeding out unhelpful search results. When it comes to videos, people want to spend less time searching and more time watching. That’s why we added an enhancement to Instant Previews—the ability to preview videos. Click once on the magnifying glass next to the title of any video search result in universal or video mode. For some videos, you'll now be able to play through a set of four short segments from the video to see if it’s what you’re looking for (video providers have to opt to make the previews available, so you won't find it for every video yet). When you’re searching on your mobile device you want to find what you’re looking for fast. Similar to the desktop version, Instant Previews for mobile displays search results in the form of webpage snapshots, so you can visually compare results without having to go back and forth between websites and search results. To use Instant Previews, go to www.google.com on your Android (2.2+) or iOS (4.0+) device and tap on the magnifying glass next to any search result. You can quickly scroll across previews by swiping with your finger and when you find one you like, tap on the preview to go straight to the page. 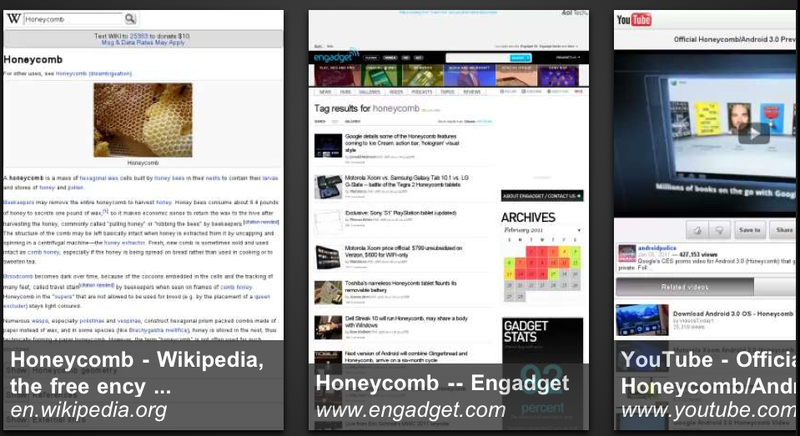 Try searching for [honeycomb] or [how to poach an egg] on your phone and preview the results to find what’s most interesting and useful to you. 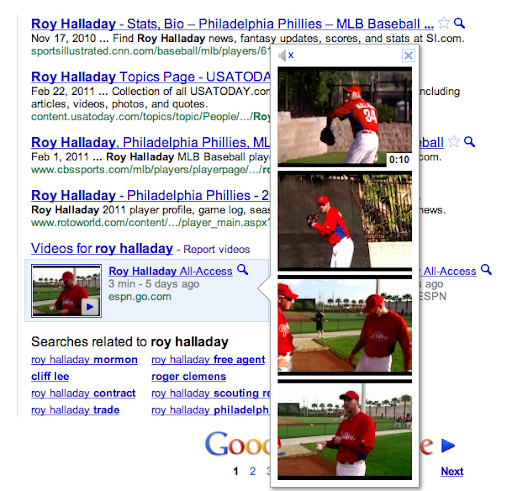 Have you ever clicked on a result and come right back to Google to look for another one? Sometimes, this happens when the first result just isn’t quite right, but other times, it could be because the entire site seemed offensive or of generally low quality. Yesterday, we announced a new option for times like these, so you can further personalize your search results and block sites that you don’t find useful. When you click a result and then return to Google, you’ll find a new link to “Block all example.com results.” If you click the link and confirm it, the domain won’t appear in your future search results. The next time you do a search that would normally return results from a site you’ve blocked, you’ll see a message telling you that results have been hidden from view. You can also manage your list of blocked sites from a separate page, which is accessible via your Search Settings, when you block a site, and when you see a blocked results reminder. This week’s changes are designed to give you more control over the information you find on Google, so you can quickly decide what’s most useful to you and get to the result you need. Information has been exploding on the web for years now, whether it's real-time, video or blog posts, but one thing has stayed the same—your time. That's our inspiration for coming to work every day: to look for new ways to help you pinpoint exactly the information you need in seconds. This is part of a regular series of posts on search experience updates that runs on Fridays. Look for the label "This week in search" and subscribe to the series. - Ed.